It is such a pleasure to be a guest in FoodThoughtsOfaChefWannabe's kitchen! I have long admired Christine for her sense of humor, witty writing style, and delicious recipes. When she requested my Asiago asparagus recipe, I was only to happy to oblige. 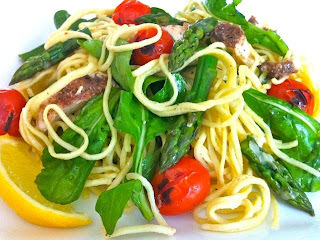 Asiago cheese is a wonderful alternative to Parmesan and ramps up the flavor of simply roasted asparagus beautifully. This is one of those easy side dishes that doesn't taste easy! Lemon slices make a pretty garnish. And because I am always looking to stretch a meal or reinvent leftovers, I like to make extra for another night and toss with sliced grilled chicken, fresh pasta, tomatoes and a handful of mixed greens. Drizzle with a little olive oil, salt and pepper, and another grating of Asiago and you will have an amazing meal in a snap! 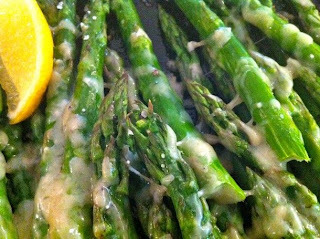 Place asparagus on a greased baking sheet and coat lightly with olive oil. I like to use my olive oil mister. You want just enough to make the salt and pepper stick but not enough to make it soggy. Sprinkle asparagus with the salt and pepper to taste. Bake at 400 degrees. Depending on thickness, this could take anywhere between 6-12 minutes. Don't hesitate to prick the thick end with the tip of a knife to check. The asparagus should be slightly undercooked at this point. Remove from oven and sprinkle with asiago cheese. Broil for 1-2 minutes, watching closely, or until cheese is melted and turning golden brown. Squeeze a bit of lemon juice overtop and garnish with lemon slices, if desired. And THIS is what she does with leftovers! Make sure to visit Ann over @ The Fountain Avenue Kitchen or find her @ The Fountain Avenue Kitchen on Facebook. Thank you Ann, I can't wait to try this, and I appreciate you sharing your talent with my readers while I am away!